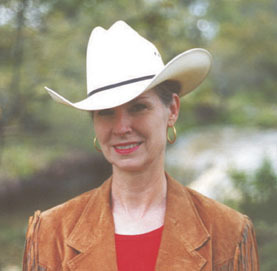 C. J. Latta was born and raised in Fredericksburg, Texas a member of a 5th generation German ranching family. After earning a Master of Arts Degree, she spent many years working as a professional illustrator and artist, including thirteen years as an award-winning medical illustrator and animator for Dr. Denton Cooley at the Texas Heart Institute in Houston. Her varied background in art has combined the observation and attention to detail of the illustrator with the painterly softness of the fine artist. Today C. J. lives on the land where her grandfather introduced her to the beauty of nature and wild Texas. In her studio on Landrum Creek, she continues to paint the wildlife and western scenes of the Texas she loves. Her paintings, based on real scenes and situations she observes, frequently tell a story, capture a humorous moment, or record a split second of splendor, making her popular with collectors and a frequent recipient of the “peoples choice” award, among others at shows. She busies herself with a large volume of commission work, and presently shows at Fredericksburg Art Gallery and other fine galleries in Texas. She has been a Federal Duck Stamp finalist and a nominee for Texas State Artist of the Year.